We were awoken early again on April 2 for our predawn game ride. Our first big game spotting was . . . a large snail crossing the road, leaving a wet trail behind him. We also saw a bird that is probably a buzzard or a vulture, a greater blue eared starling, and a giant termite mound built against the trunk of a big tree. We saw a herd of zebras, one of wildebeest & one of warthogs. We also spotted a couple of black-backed jackals walking up the road toward us, but they were gone before we could stop and get a good picture. 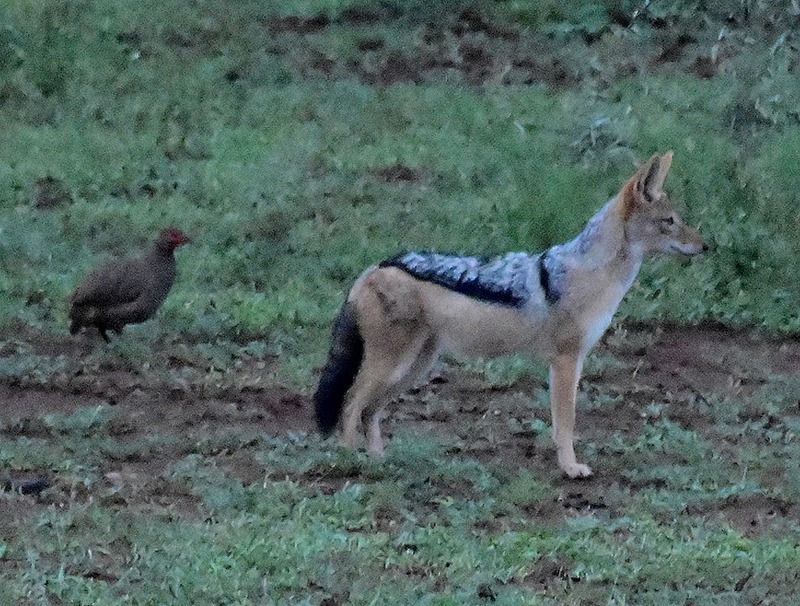 I have included a picture of a jackal we didn’t see, taken by someone who was at a different camp, just so you can see better what they look like. There was also another female lion hiding in the tall grass. Then there were more birds, some new some old. We saw a European Roller, a Red-billed Hornbill, a Steppe Buzzard and a little gray bird that might be an African Dusky Flycatcher. There was also a Red-backed Shrike sitting on a thorny acacia tree. We were told that giraffes like to eat these trees, but it’s hard to imagine having all these long thorns in your mouth. 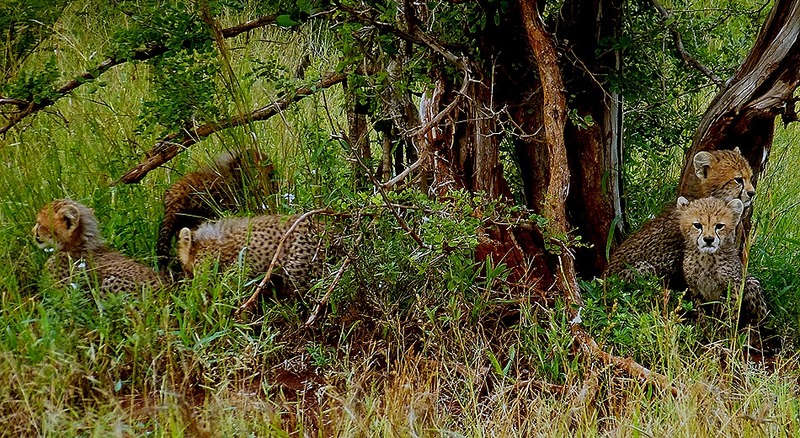 We found another family of cheetahs, the supposedly elusive species we have now seen for the second time in two days. This time it was a mother with four or five cubs, but the cubs were a bit older & bigger than the ones we saw yesterday. Cheetahs are an endangered species with only about 7,000 left, a majority in South Africa. Lions and other big cats prey on their young so that only about 5% live to 2 years, which is about when they can go out on their own. Cheetahs are also the fastest land animals in the world, capable of 60 to 70 mph in short bursts. It is hard to tell the adult from the cubs unless they are in a picture together, so we will make our best guesses about that. We stopped for our mid-morning snack. While we were out on the ground we saw a huge striped centipede trying to hide under a rock & a large dragonfly with transparent wings, each with a large spot. By this time we had seen four of the “big five.” which include Lion, Elephant, Rhinoceros, Cape Buffalo & Leopard. Seeing these five species is the general standard for a successful safari and often advertised by safari companies. But the “big five” was originally compiled as the ultimate goal for hunters because these were the hardest to bring down on foot with a rifle. This would seem to have little relevance for a modern photo safari, but it is still considered a test for a successful safari. Since this was our last full day on the safari we were beginning to wonder if we would see a leopard, which Safiso had told us was often impossible to find. Then Safiso received a call on the radio from another safari driver who told him they had found a leopard in a tree. Safiso told us it was a long way from us & that it could well be gone by the time we got there, but we all agreed we should try. Determined to get us to the leopard on time Safiso gunned the engine (as much as you can in an open vehicle on a dirt road). We called it a Ferrari Safari and it was bumpy and fast. Still, it took about half an hour to get there & by the time we arrived the other vehicle was gone and the leopard was nowhere to be seen. Safiso thought there was a good chance the leopard was still hiding in the area so he took our vehicle off the road and explored through the bushes. Sure enough, eventually he spotted the leopard hiding in a bush. It’s hard to understand how he saw it since we had trouble seeing it there even after we were told where to look. It was disappointing to think that we were this close and still unable to really see it, but then the leopard got tired of playing hide and seek. It stood up and walked to a nearby tree, then climbed the tree and spread out on a large branch to watch us with legs hanging down on either side for balance. Not satisfied with this view from behind, Safiso pulled the vehicle around to the other side of the tree where there was a beautiful view of the leopard from the front. She didn’t seem to mind, maybe because she felt more secure up a tree. While she was settled on the tree branch we were able to get a number of close portrait shots. We spent a long time with the leopard (we took more than 50 pictures altogether) before returning to camp for breakfast. Safiso said this was the longest game drive he had ever done, & he’s been doing this for many years. On our way back to the camp we encountered a mixed group of herbivores on the road: giraffes, zebras and warthogs. There was a mongoose running down the road ahead of us, too far & fast for a good picture, and a large bird that may have been a bustard. After breakfast & a shower we went back to the veranda of the main lodge to relax for the rest of the day until time for our sunset game drive. Our old friends the hippos, egrets, Blacksmith lapwing and Egyptian geese were still there. We also saw some black-headed herons and some impalas across the lake. And a bold little bird was standing on our our shower head, possibly a crimson-breasted shrike. Across the lake we saw a family of elephants hurrying off to our right after drinking their fill. A rhino came down to drink on the other side of the lake. He was accompanied by four egrets who were jockeying for about three seats on the rhino’s back. No picture of it, but at one point an ejected egret perched on the ground behind the rhino was covered by a huge rear-aimed spray of urine from the rhino. Yuck. I guess this is just one of the hazards of earning a living. There was another black-headed heron in the marsh on the other side of the lake. A wildebeest put in an appearance. And we spotted a skull from a Cape Buffalo on the other side as well. Daniel told us its story. One night a large herd of buffalo wandered up the shore of the lake on the side where the camp is located, a pretty narrow area. As they walked past the camp a pride of lions appeared at the other end. They tried to go back the way they had come but another group of lions was stationed there. With nowhere to go the buffalo spent the night by the shore in front of the camp’s cabins. In the morning they left, but about half a dozen of them didn’t make it past the lions. This skull belonged to one of them. Another highlight this afternoon, an old elephant with very long tusks came walking up the shore right in front of our verandas. Daniel said he is a regular visitor. We all ran up to the veranda of the last cabin to keep him close and coming toward us as long as possible. Rick got there about the same time as the elephant, who turned to see what the commotion was. Don’t worry, there is an electrified fence between the elephant and the veranda. The elephant then stepped into the water again for a few steps. At that point we noticed there was another large elephant just across the lake. They looked at each other for a while & we thought there might be trouble, but the elephant near us eventually looked away and walked on. The elephant across the lake was actively drinking and bathing. After a while he turned around and lumbered away past a resting wildebeest & the buffalo skull. Meanwhile the elephant on our side of the lake continued his walk away from Camp Shawu. During the afternoon we took some pictures of our group hanging out on the main veranda. As game drive time approached Safiso showed up so we were able to include him in some pictures. We set out on our last evening game drive. We saw several birds, including a Black-shouldered Kite, a Wooly Necked Stork, and a Pearl Spotted Owl. We came across a family of elephants as the sunlight began to dim. This is really the day for elephants! They walked by us, then away past a tree. We ran into a female waterbuck. Safiso thought it was a kudu, a species of antelope we had eaten for dinner the night before, but further research indicates he was mistaken. They look very similar but female kudu have a white strip across their noses, while waterbucks have a distinctive white circle around their behinds, which you can barely see part of in the second photo. A pretty easy mistake to make when the animal is far away and behind some bushes! We had a very beautiful sunset this evening. We stopped for our usual sundowner with the other camp vehicles. On the way back to the camp we came upon a Marsh Owl standing in the road. We also saw some trees filled with bird nests. Safiso told us that one very large nest was home to a large number of birds at a time. We also saw a Secretary Bird, a huge bird with a goofy looking head. But as soon as he was caught in the spotlight he took off, much too fast to get a picture. When we got back to the camp the moon was shining brightly over the lake. Thembisile came out as she always did before a meal to announce the menu, & told us that unfortunately there would be nothing for dinner. Funny, but hardly credible at this place! In fact we had a particularly fine going-away dinner, highlighted by delicious grilled lamb chops & a passion fruit cheesecake that was truly memorable. After dinner we were about to go back to our cabins when we were told to stay put. Then we heard a rhythmic beat in the kitchen and out came Daniel, Thembisile & Pretty dancing and singing. The rhythm was beaten out with a wooden cooking spoon on a plastic food container. It was quite a show & something we certainly weren’t expecting. A few of these pictures were taken by Rick (you can see him doing it in pictures 9 & 10 below), but most of them were extracted from a phone video taken by Robert. Despite efforts to improve focus and contrast in the extracted photos they are rather below standards. Don’t get me wrong, Robert’s video was great; it is just the photos made from the extracted frames that aren’t so hot. But they do give you a pretty good idea of what was going on. After a while they induced a few of the guests to join in the dancing, following Thembisile’s lead. They danced out the door into the kitchen, with Daniel still beating the rhythm on a plastic food container. So a great time was had by all, a perfect end to an extraordinary day.